Sulfur and Vitamin C help the body repair itself and to handle physical stress in a healthy manner. They are both antioxidants which can remove free radicals, slowing the aging process while boosting our bodyï¿½s ability to heal. This shows in their support for skin, joint and bone health, and improving our energy level and positive mood. Both sulfur and Vitamin C are water soluble which means the body doesnï¿½t store these nutrients. They are excreted from the body in about 12 hours. Many people have a deficiency since food processing, transport, storage and cooking diminish the amounts remaining in foods rapidly. Along with organic sulfur (found naturally in the body in the form MSM, methylsulfonylmethane ), your body uses Vitamin C to create new, healthy cells and connective tissue. An adequate supply of sulfur and Vitamin C together synergistically support healthy cell regeneration and the immune system. Organic sulfur allows for better absorption of nutrients while helping to create flexible, soft and smooth skin and hair, and joints. If you want to supplement with both, this is the package for you! One great characteristic of MSM is that it makes the cells in your body more permeable. This allows wastes and toxins to be removed out of the cells and oxygen to enter the cells. This contributes to detoxification of the body and increased energy. The body is then more able to assimilate nutrients and be more hydrated. This is part of why Vitamin C and MSM works so well together. MSM supports the efficient absorption and assimilation of the Vitamin C.
Another great benefit from sulfur is that it is supportive for bone, joint and muscle health. Sulfur is known for its anti-inflammatory property and it also helps to increase flexibility and exercise recovery time. MSM helps to repair the tissue cells in our muscles that break down during exercise and helps remove lactic acid build up which results in less soreness, pressure and cramps. Sulfur and Vitamin C are both energy boosters, sulfur because it helps oxygenate the cells and Vitamin C because it helps fuel mitochondria efficiently. In addtion, Vitamin C is concentrated in healthy adrenal glands. Vitamin C deficiency is marked by reduced adrenaline secretion. So, with sulfur acting providing oxygen and carrying away toxic wastes, and Vitamin C boosting adrenal efficiency, you have great combination for increased energy. Sulfur helps to improve immune function, lower inflammation and help restore healthy bodily tissue. This includes supporting skin health and complexion. Both sulfur and vitamin C are necessary for the body to make collagen which is what gives skin its structure, strength and elasticity. Adequate amounts of sulfur and vitamin C can help reduce wrinkling of the skin and appearance of scars, dark spots and sun damage. Sulfur is known as the ï¿½beauty mineralï¿½ not only for its effects on our skin but also because it strengthens hair and nails. Sulfur can help with thinning hair and makes hair appear shinier and healthier. Pure Organic MSM Sulfur Crystals Minimally processed with no additives or fillers. Lasts approx a month. 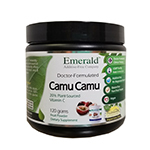 Camu Camu 100% pure fruit powder, 400 mg Vitamin C per serving. 60 servings per container. This supplement is 100% Additive-Free, Gluten Free and Vegan without any added sugar! Unsweetened, but tastes fruity, not tart like ascorbic acid powders. Dietary supplement FREE of milk, soy, salt, sugar, wheat, yeast, gluten, artificial flavors or preservatives. Product is manufactured in a facility that processes milk, egg, soy, tree nuts, fish & shellfish. 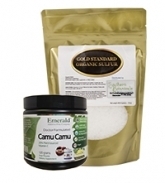 Camu Camu: 100% pure fruit super-high in Vitamin C (not ascorbic acid). No fillers or additives. Each serving contains 400mg of vitamin C, that's 118% of your daily recommended intake! 60 servings per container. Sulfur Take 1 flat teaspoon Organic Sulfur Crystals twice daily, dissolved in water. The easiest way to dissolve is to put your teaspoons of sulfur into pure water in a glass water bottle and let sit overnight (or for a few hours.) In the morning, it will be ready to take and drink all day. Sulfur, like Vitamin C is not stored in the body. It is a water-soluble nutrient, and it must be replenished daily. It leaves the body after about 12 hours. You can increase the amount gradually to up to per 1 teaspoon per 100 lbs body weight twice a day. Some try taking up to a Tablespoon twice a day to saturate tissues and get cleansing done rapidly. After a month or so at the higher amount, we recommend you reduce back down to 1 teaspoon per 100 lbs of body weight twice a day. 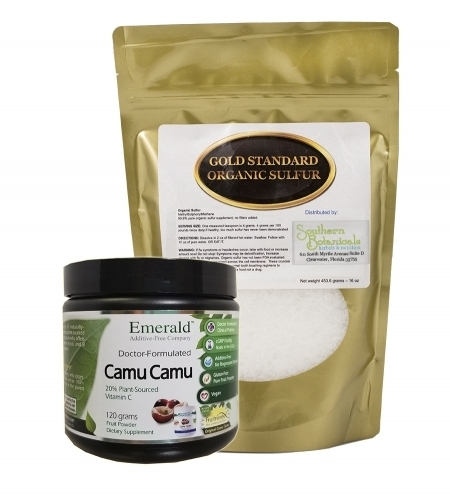 Camu Camu Unsweetened, but tastes fruity, not tart like ascorbic acid powders. Mix one small scoop daily (about 1/2 teaspoon), or as directed by a Health Care Practitioner, into juice, smoothie, yogurt, applesauce or water. Great for everyone, including kids and seniors! At mg per serving, that's 118% of your daily recommended intake! Very absorbable, with all the natural co-factors. But if ever you want to double up on your doses, you don't have to worry about taking double the additives because this powder is additive-free! Taking either vitamin C or Sulfur in excessive amounts can cause loose bowel movements. If this occurs, reduce intake until symptoms resolve. Read more about the benefits of Sulfur for Better Health? Yes, 10 Surprising Ways.